Located adjacent to Linden Park at 999 43rd street in Oakland, the property can be described as transitional on many levels. In the urban sense, the neighborhood remains somewhat edgy but is slowly absorbing some of the calming effects of gentrification. Although momentum has stalled somewhat since the economic downturn, recent re-occupation of two nearby warehouses, one as housing and one as a charter school, has contributed significantly to establishing a more hospitable and engaging character to the neighborhood. 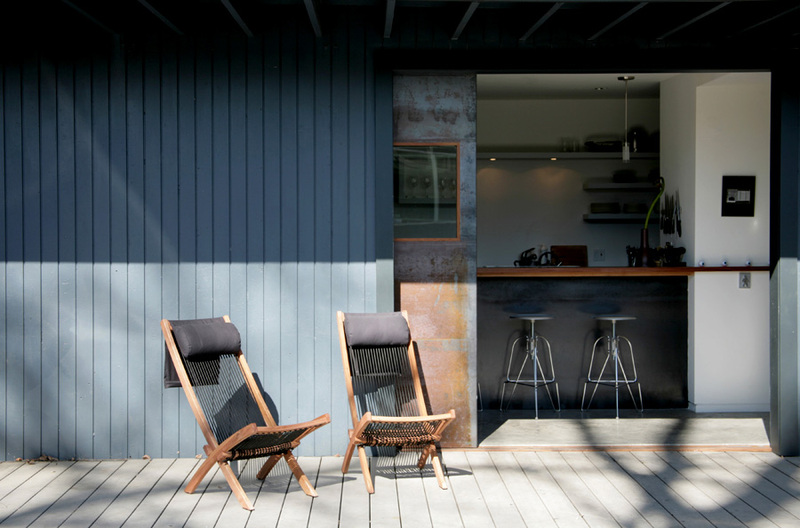 Living here remains a dynamic balance between embracing the community and maintaining privacy. Since this was intended as a live/work compound, the building needed to accommodate an office, a residence, as well as retain its workshop. It was a tight fit even for a bachelor—the living and dining room doubled as a meeting space and lounge for bL’s crew. Growth in the business and a diminishing enchantment with the 24hr comingling of my personal and professional lives compelled phase one of expansion. This took the form of a retired freezer shipping container which we transformed into an office located in the back lot. My personal office remained in the main building while other work stations migrated out back. 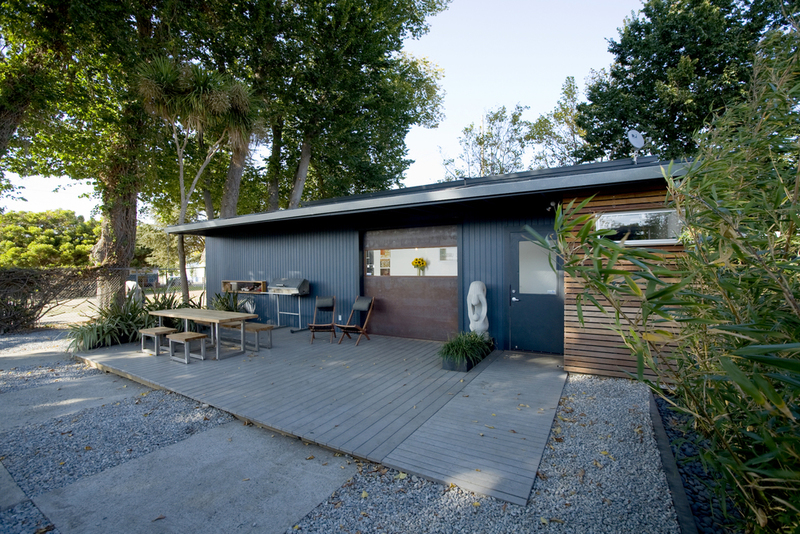 A year later, marriage and imminent parenthood prompted a second, contiguous shipping container conversion. Practically speaking, this allowed adequate and varied space to compactly accommodate both family and business. 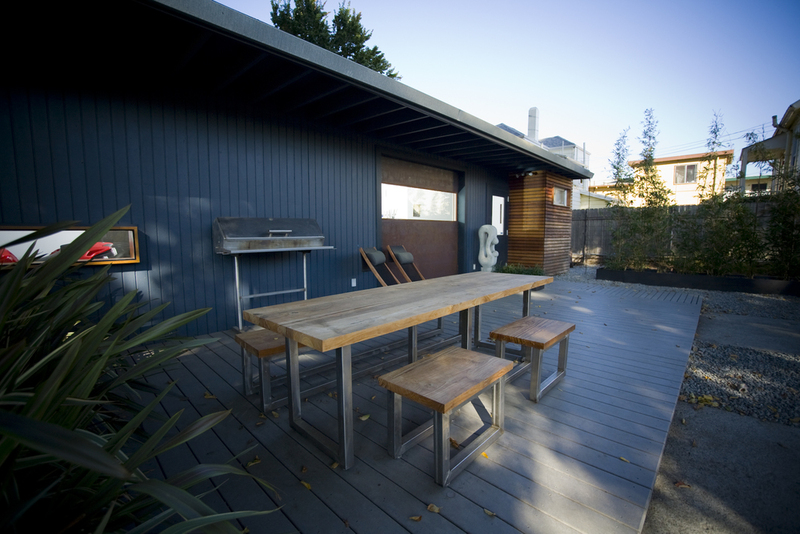 Architecturally, the second container allowed the formation of layered inner courtyard that provides privacy without hermetically sealing us off from our neighbors. 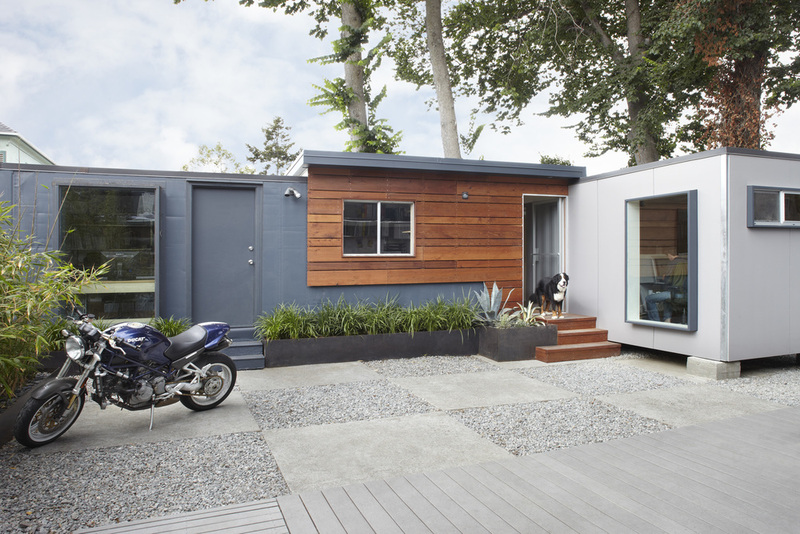 The container conversions are a significant part of extensive green building credentials. These include myriad reclaimed, non-toxic and sustainably sourced materials and a solar thermal system servicing both domestic hot water and hydronic heating. In 2008, Build It Green featured the property on a green home tour. Aside from the container additions, we have stayed within the bounds of the existing building envelope. The process has been and continues to be one of discovery and dialogue; the proverbial Khanian brick in the form of a north Oakland warehouse.